Brigid Quinn is a 60-year old retired FBI agent, in a later-in-life marriage. I like that she is 60! She leaves her Tucson home to travel to Florida, where her father is dying in a hospital, and her relationship with her mother is as complex as ever. AND, of course, she reconnects with her colleague Laura Coleman who is working to exonerate Marcus Creighton, a man on death row, just days before his execution for murdering his wife and children. There are familiar, complicated family dynamics at play in this novel, as well as a juicy mystery to solve. And Brigid Quinn is highly involved with both! I like Masterman's writing. Here is an example of what I found interesting, page 98: “Sebastian, Vero Beach’s lower-middle-class neighbor, nestled unapologetically, almost with a smirk, beside her wealthier enclave.” “Unapologetically, almost with a smirk”? I like this creativity, turn of a phrase, anthropomorphism! Ms. Masterman's story moves fast and is engaging. It is complex enough to keep you wondering. Why not four hearts, then? Well, it isn’t a must-read; it is a fun read! Despite its over-dramatic title, it draws you into relationships and circumstances. 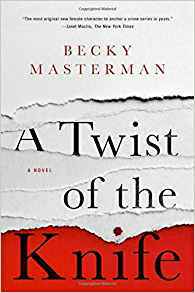 If you are ready for a break from this year's reads about WW2, Appalachia, and grit, A Twist of the Knife will satisfy. A Twist of the Knife is on my list!!!! !